Call on us for effective and safely-performed yellow jacket removal. Some people think that yellow jackets are one of the more attractive looking species in the stinging insect world. 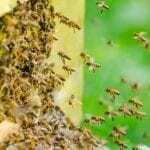 Even if you fall into that category, you probably do not want a swarm of them around your property and you definitely do not want to put yourself or your family in danger of being stung. Here at Florida Bee Removal, we have been providing yellow jacket removal in the Tampa, Florida area for more than 55 years. We are fully licensed and insured so you can feel confident calling us for services for your home or business. One of things that we owe to our longevity and stellar reputation in this area is that we take the time to listen to the concerns of our clients before we get started resolving the problem. We make certain that we understand what your expectations are and we give you a detailed plan on what we will be doing for your yellow jacket removal situation. We utilize the best techniques for yellow jacket removal that are far safer than the DIY methods that could be hazardous for you, your family, and pets. Our industry-grade products are effective, and we back our work with written guarantees and warranties. Our technicians are kept abreast of all new developments in the yellow jacket removal field so that we are always providing you with the best possible services. If you are having a problem with stinging insects at your home or business, including yellow jackets, bees, wasps, or hornets, don’t hesitate to call us. We are available day or night for emergency situations and we are happy to provide an onsite inspection to give you peace of mind that your family and guests are safe from an angry swarm that has taken up residence on your property and isn’t too keen on sharing.